The classic Holly Hill Sling Collection translates very well into a counter or balcony height stool. The simple and classic design will blend beautifully into your casual lifestyle. The Holly Hill Swivel Rocker Balcony Stool is made of extruded aluminum which is heavy-duty and rust-proof; it glides easily on a smooth swivel mechanism for ease of access. Balcony height seating is ideal for older adults who may find getting in and out of traditional patio furniture a chore. It is also the best solution for any area you may want to preserve a view; over a fence, deck or balcony railing, for example. And think how these stools would complement that new outdoor kitchen! 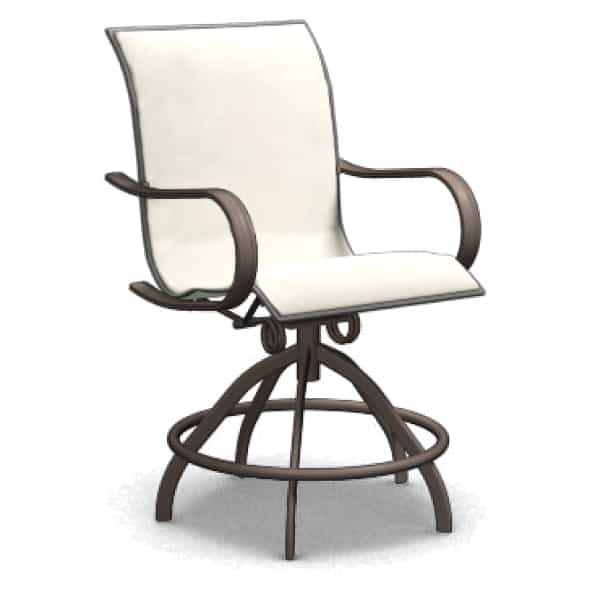 The best thing about the Holly Hill Swivel Rocker Balcony Stool, however, is that it is a rocker, just as the name implies. Homecrest has upgraded sheer comfort once again with this unique innovation. You won’t find a more comfy outdoor counter stool!